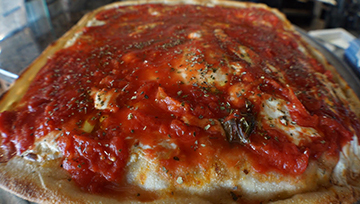 Vittoria's NY Style PizzaWelcomes You! When it comes to food and hospitality there is no substitute for the passion it takes to create authentic, fresh and delicious cuisine. We have been fortunate to serve the Westerly community since 2002 and take tremendous pride in being a local favorite for fresh Italian fare. Vittoria’s is our fast-casual version of Vetrano’s and gives us an opportunity to provide the same great Old World flavors out of our location in Dunn’s Corners. Our practice of offering fresh and made to order cuisine continues at Vittoria’s. We are happy to embrace the traditions started at Vetrano’s and look forward to seeing you for your next visit! Any kind listed above - 16"
Pizza is my favorite food. I've stopped here for lunch a couple times over the summer. Each time, I have eaten some of the best pizza I've ever had. My favorite is the Buffalo chicken pizza. It's so tasty! Excellent gluten free pizza! My friend had the best non gluten free pizza since leaving the Bronx back in 1967! Loved it. Fast service. Casual atmosphere! Would definitely go back! Came here for the first time today for lunch. This is by far the best pizza I have had since moving to RI. Totally worth the drive!! Receive Updates, Coupons, & More To Your Inbox! Subcribe Today!